Of all the celebratory meals of the year, Thanksgiving dinner is the one that least calls for a big dessert (at least in my humble opinion). There's something about stuffing oneself with slices of a giant bird along with five or six side dishes—that reduces one's enthusiasm for another course. Even if it is the most delicious pumpkin pie, can you really appreciate it to the fullest—no pun intended!? The perfect dessert solution for Thanksgiving Day! To combat this problem, I offer a solution: mini cupcakes! 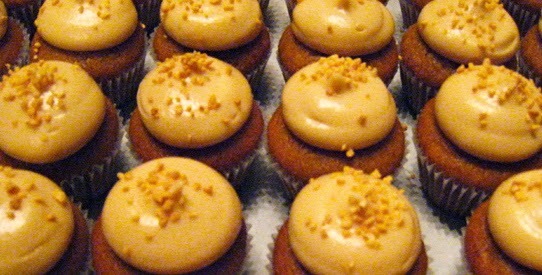 I highly recommend the Pumpkin-Spice Mini Cupcakes from Mission Minis bakery in San Francisco's Mission district. 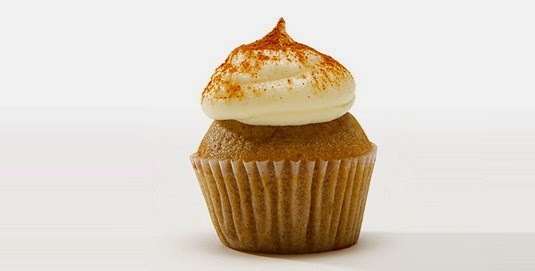 Their moist little cupcakes taste very similar to pumpkin pie but are the perfect size—just two bites! Topped with vanilla cream cheese frosting, they're just enough to satisfy you but not too much to push you over the edge after your feast. Plus, it's easy. You can call ahead to order from Mission Minis, and they will deliver anywhere in San Francisco. It's a nice way to save time—allowing you to enjoy the holiday! If you'd rather make your own cupcakes, this is something that you can prepare ahead of time. You could make the batter a day or two before Thanksgiving and then bake them at the last minute. To prepare the mini cupcakes: Preheat oven to 350 degrees Fahrenheit. Sift the flour, baking powder, baking soda, cinnamon, nutmeg and cloves into a bowl. In a large bowl, mix together the pumpkin purée (must be canned, fresh pumpkin purée doesn't work well), vegetable oil, sugar and salt. Add the eggs one at a time, mixing well to incorporate into the mixture. Add the flour mixture to the pumpkin mixture with an electric beater on medium speed or simply by stirring with a wooden spoon—until the mixtures are blended together. Divide the batter evenly into 4 dozen (48) mini cupcake tins with paper cupcake liners. Bake for 15 to 18 minutes. To prepare the frosting: Bring the butter and cream cheese to room temperature. Using an electric beater on medium speed, whip the butter and cream cheese for 2-3 minutes until light and fluffy. On low speed, incorporate the sugar and then the vanilla and cinnamon. Then increase the mixing speed and whip for 1-2 minutes until the frosting is fluffy. Use a pastry bag to decorate each mini cupcake. Or simply spread the frosting on each mini cupcake with a butter knife—for a more "homemade" look. Dust each mini cupcake with just a touch of ground cinnamon to finish the decor. Thanks to Mission Minis for the Thanksgiving cupcake inspiration! Love the pics and the recipe! Now I can make these even when I can't purchase them!